Geraldine McNulty McLaughlin could not stop looking up — or around — as she stood in the center aisle of a crowded Cathedral of St. John the Baptist here on Saturday morning June 24 about an hour before the start of the Mass for its rededication by Bishop Serratelli. The Serra Club of Paterson hosted its annual event honoring seminarians and retiring priests with a Mass at St. Gerard Majella Church in Paterson June 20, followed by a dinner at the Brownstone, also in Paterson. Bishop Serratelli made a pastoral visit to St. Joseph Parish in West Milford to serve as the main celebrant and homilist at the noon Mass, on Sunday, June 18, the Feast of Corpus Christi and also Father’s Day. Afterward, the Bishop presided over a Corpus Christi procession from the church and on the grounds of St. Joseph’s, the oldest parish in New Jersey. Bishop Serratelli made a pastoral visit to St. Anthony of Padua Parish here June 17 for the vigil Mass marking the Solemnity of Corpus Christi. During the Mass, the Bishop administered the Sacrament of Confirmation to 51 young people. These young people were prepared for the sacrament through the parish’s Confirmation program. Bishop Serratelli presided at the solemn profession of final vows for Discalced Carmelite Sister Judith Kallah in the chapel of the Monastery of the Blessed Virgin Mary of Mount Carmel in Morristown June 19. As the Catholic Church continues to celebrate the 100th anniversary of Our Lady’s apparitions in Fatima, the Diocese will once again host its diocesan Marian Pilgrimage to the nation’s capital Oct. 21. The Bishop invites the faithful throughout the diocese to join him for a day dedicated to the Blessed Mother, the patron of the Americas, at the Basilica of the National Shrine of the Immaculate Conception. Saturday, June 24 was a day of great joy and rejoicing like no other in its 80-year history for the Diocese of Paterson as Bishop Serratelli led the rededication Mass for the Cathedral of St. John the Baptist here. The cathedral doors opened Saturday for the first time since September 2010, when ceiling tiles and plaster fell in the nave of the cathedral. On June 17, Bishop Serratelli helped the Sisters of Christian Charity at Mallinckrodt Convent in Mendham celebrate the 200th birthday of their order’s founder, Blessed Pauline von Mallinckrodt, serving as the main celebrant and homilist of a Mass in the Chapel of Mary Immaculate at the Motherhouse. Blessed Pauline founded the Sisters of Christian Charity in Germany on Aug. 21, 1849. Attending were priests from the parishes in which the sisters serve, staff persons, friends of the community and the Companions of Pauline, lay people who have answered the call to proclaim Christ to the world by living out the charism of Blessed Pauline in their lives. Afterward, the order hosted a dinner in the motherhouse and gave a presentation on their founder’s life, ministry and the charism as it is lived today by the congregation. There, Bishop Serratelli blessed a portrait of Blessed Pauline, commissioned by Anthony and Marilyn Bastardi and painted by Stefania Panepinto. The beginnings of Catholicism in Paterson date to 1816 when itinerant missionaries began offering Mass in private homes every few weeks. 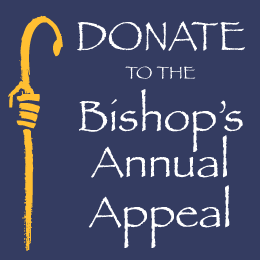 In 1820, Bishop John Connolly, O.P. of New York assigned one of his eight priests, Father Richard Bulger, to Paterson. Bulger was the first priest permanently assigned to New Jersey. The following year, the first St. John’s was built on the corner of Mill and Market Streets for $1,000. This church was quickly outgrown, and in 1833 a new stone church was built on Oliver Street for $15,000. On Oct. 30, 1863, Bishop James R. Bayley of Newark named Father William McNulty as St. John’s 13th pastor. During Dean McNulty’s nearly 60 years as pastor (he was named Dean of Passaic and Bergen Counties in 1886), Paterson’s population would grow to more than 100,000 people. The Dean’s vision for St. John’s kept pace with that growth. When the St. John’s Church was opened in 1870, the original windows were of cheap colored glass. There are still remnants of those windows in some of the auxiliary areas of the present cathedral, for example, in the sacristy, and in the lancet window nearest the Tabernacle. However, the intention was always to replace the original windows with fine stained glass windows as funds became available. Between 1870 and its final consecration on June 29, 1890, funds were raised to “complete” the church, including the bell tower, the minarets on the front of the church, the side chapel, and other interior features. The Mass for the Dedication of a Church is rich with rites and signs that celebrate our faith that is “built upon the foundation of the Apostles, with Christ Jesus himself as the chief cornerstone” (Preface of the Eucharistic Prayer for the Mass of Dedication). In the Old Testament’s Second Book of Chronicles, Solomon prays at the dedication of the Temple in Jerusalem: “Let your priests, Lord God, be robed in salvation, let your faithful rejoice in what is good!” (2 Chronicles 6:41). At the conclusion of Solomon’s prayer “the glory of the Lord filled the temple of the Lord” (2 Chronicles 7:1). The Temple dedication was vital for God’s chosen people because through the Temple Israel understood her identity and in the Temple sacrifices to God were made. The Temple was the dwelling place of the Lord God. Bishop Serratelli will rededicate the Cathedral of St. John the Baptist in Paterson on Saturday, June 24, after the 147-year-old Neo-Gothic house of worship in the heart of Paterson received a colossal $17.4 million rehabilitation. The six-year project corrected serious structural issues — a grand undertaking to preserve the majestic structure for future generations. The painstaking — and often dangerous —project also sought to preserve the history and beauty of the interior and exterior of this towering structure, while also reconfiguring its worship space and giving it some modern styling and amenities. On the feast of the Nativity of St. John the Baptist, a new chapter will begin in the history of the Paterson Diocese with the reopening and rededication June 24 of its Mother Church, the Cathedral of St. John the Baptist in Paterson. Bishop Serratelli will be the principal celebrant at the 10 a.m. Mass of Dedication. Among the prelates attending are Cardinal Theodore McCarrick, Archbishop Christophe Pierre, apostolic nuncio to the U.S., Bishop Emeritus Frank Rodimer, Benedictine Abbot Richard Cronin of St. Mary Abbey, Morristown, and bishops from around the state and nation. One of the greatest gifts to our health care system in the United States is the many faith-based hospitals we have. Faith-based hospitals’ strong religious heritage drives them to provide compassionate care to people of all faiths and backgrounds — and their wellness services go beyond just providing medical care. Soft notes of a piano and cello introduce the ballad “Do Not Be Wise in Your Eyes,” before a female voice starts to deliver in an equally gentle melody this surprisingly urgent message for today’s listeners — avoid making mistakes in life by following the Lord’s clear and moral path. Living up to its motto “Esto Dignus” which translates to “Be Worthy,” the St. Kateri Columbian Squires in Sparta reached out to help a city thousands of miles away following a devastating earthquake in Norcia, Itazly. The Squires at St. Kateri, whose members range in age from 10 to 18, led the effort to help the town, where many buildings were destroyed in the earthquake last fall.